Raw Protein is what your cat craves instinctively. 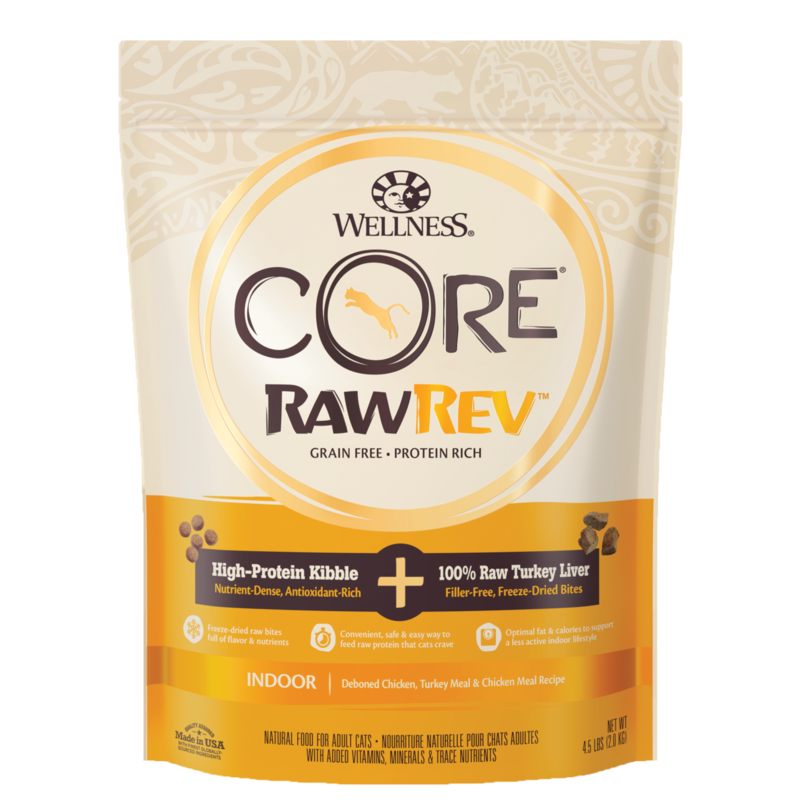 CORE RawRev allows you to add raw easily and safely to every meal. This high-protein, grain-free kibble is combined with 100% pure bites of freeze-dried turkey liver. These raw pieces are incredibly tasty and provide a boost of protein, enzymes and minerals in their most natural state. This combination creates a flavor-rich, nutrient-dense meal that supports lean muscle, healthy weight and a shiny, healthy coat. With more of the protein your cat craves and no fillers like wheat, corn, or soy, it’s easy to provide the nutrition your cat needs to thrive from the CORE. 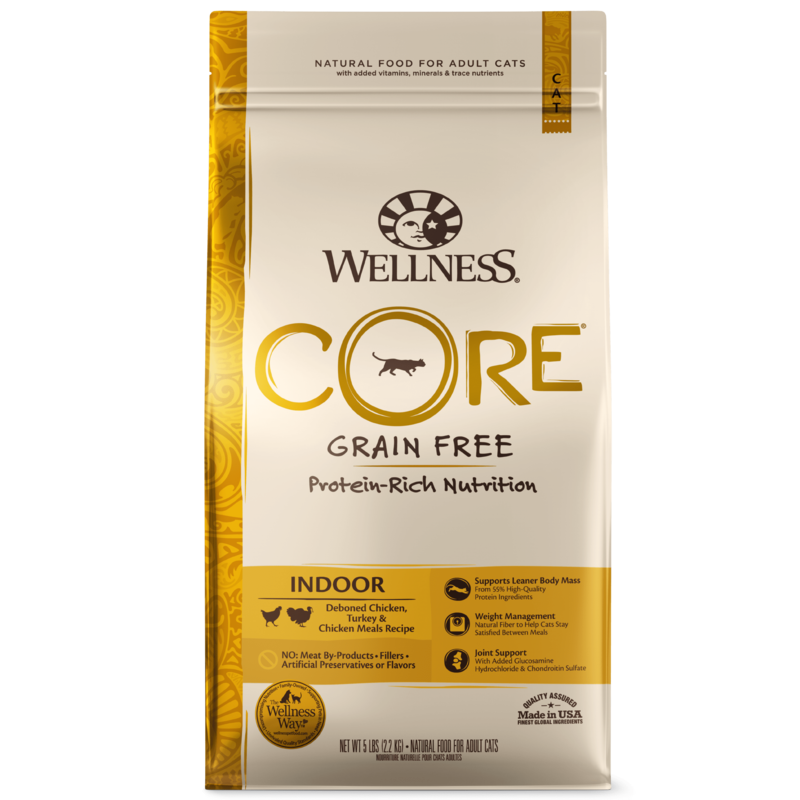 CORE RawRev Indoor has been formulated with optimal levels of fat and calories to support cats with a less-active indoor lifestyle. Deboned Chicken, Turkey Meal, Chicken Meal, Peas, Potatoes, Turkey Liver, Tomato Pomace, Ground Flaxseed, Chicken Fat (preserved with Mixed Tocopherols), Natural Chicken Flavor, Chicory Root Extract, Choline Chloride, Cranberries, Taurine, Vitamin E Supplement, Glucosamine Hydrochloride, Chondroitin Sulfate, Dried Kelp, L-Carnitine, Zinc Proteinate, Mixed Tocopherols added to preserve freshness, Zinc Sulfate, Calcium Carbonate, Niacin, Iron Proteinate, Ferrous Sulfate, Yucca Schidigera Extract, Vitamin A Supplement, Copper Sulfate, Thiamine Mononitrate, Copper Proteinate, Manganese Proteinate, Manganese Sulfate, d-Calcium Pantothenate, Sodium Selenite, Pyridoxine Hydrochloride, Riboflavin, Vitamin D3 Supplement, Biotin, Calcium Iodate, Vitamin B12 Supplement, Folic Acid, Ascorbic Acid (Vitamin C), Dried Lactobacillus plantarum Fermentation Product, Dried Enterococcus faecium Fermentation Product, Dried Lactobacillus casei Fermentation Product, Dried Lactobacillus acidophilus Fermentation Product, Rosemary Extract, Green Tea Extract, Spearmint Extract. 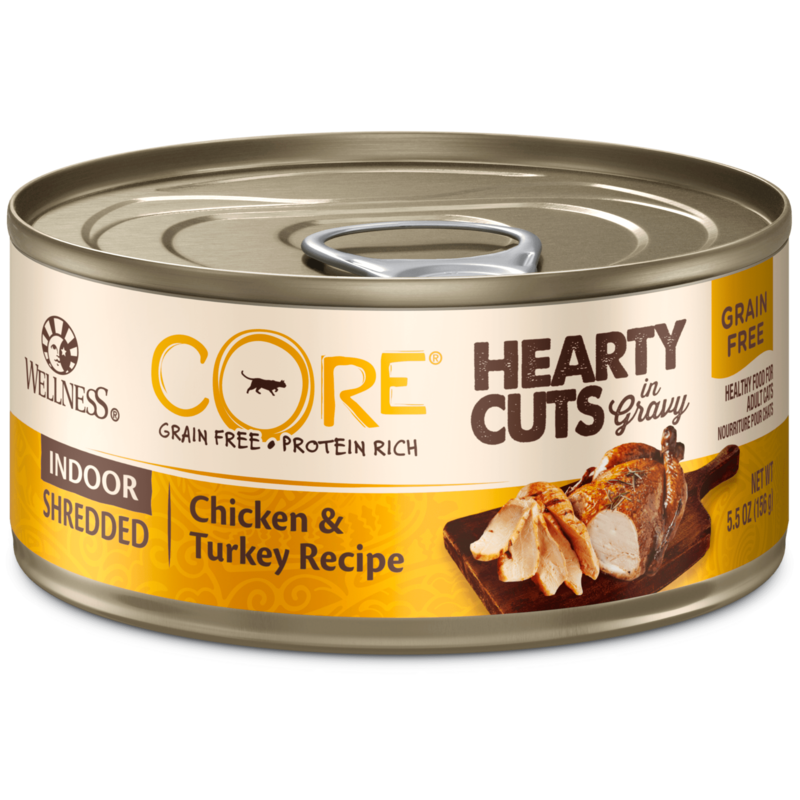 Wellness CORE RawRev Indoor Deboned Chicken, Turkey Meal and Chicken Meal Recipe Cat Food is formulated to meet the nutritional levels established by the AAFCO Cat Food Nutrient Profiles for maintenance. †based on Wellness wet cat food. Calorie Control: This food contains 3,627 kcal/cup or 453 kcal/cup ME (metabolizable energy) on an as fed basis.